Over two dozen witnesses reported a bright, slow moving fireball over central Texas last night slightly after 9:00 PM local time. Most reports were clustered around Austin and San Antonio. 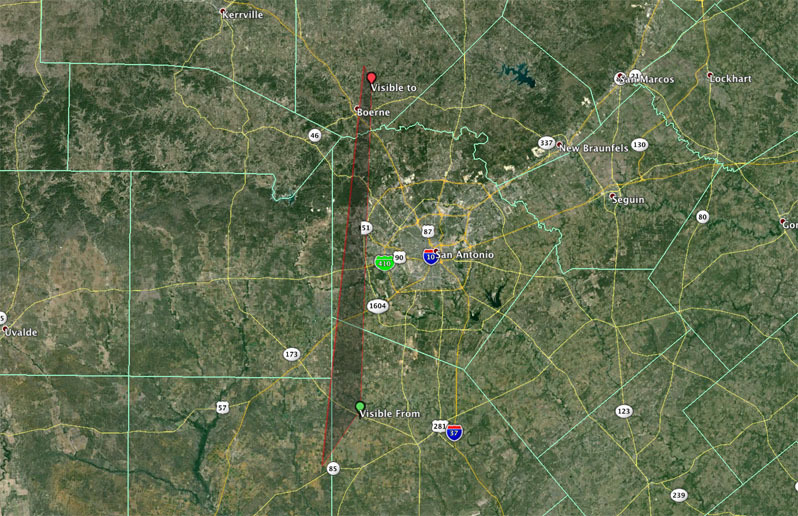 An analysis of the witness reports estimates that the fireball was traveling from the south to the north just west of San Antonio. Below is a video of the fireball that was uploaded to youtube. If you witnessed this fireball report, please fill out an official fireball report. We reside in WImberley, TX and observed this very bight fireball at about 9pm last night. my girlfriend and I also saw that same fireball in Waikiki Hawaii. My dad lives in Red Rock, TX and on the night of June 22nd he told me that just about dark he saw a fire looking ball (he’s 91) towards the SW from the area. Which would have been towards Lockhart/San Marcos area. My husband & I were headed to Fredericksburg, Tx. at about 9:00 PM. On July 22, 2015. We were on Hwy 281 between Evant & Adamsville, huge bright blue flash with firey tail, lasted 3-5 seconds, traveling from SW TO NW, incredible sight! Saw the fireball from Rockport Texas on July 22, 2015 around 9:00pm. It was a red ball and had a greenish tail and moved across the sky relatively slow. Absolutely amazing. Saw the firiery ball of light over Alice Texas around the same time,9ish, on july 22nd. Alice Texas is located 2 hours south of San Antonio. Was greenish and could see the tail particles and as it looked as it was coming down two bright green glows lit up the sky. Saw this remarkably bright fireball from a highway in Austin, Tx. My girlfriend Marie and I saw this meteor in central Pennsylvania near Gettysburg last night. We were at a drive in movie theater facing south west at approximately 10:15 our time,, we saw this meteor dive at a steep trajectory from the south east to the south west.. It almost literally looked as if it was going to hit the giant drive in movie screen,, but of course lol it did not..
We were on hwy 183 between Brenham and Austin when we saw it. Bright glowing green and relatively slow moving. we live in Haskell tx. and saw this from Stamford lake . I live in Sanger and was amazed to see so many beautiful shooting stars. I counted almost 20 moving from east to west. I also saw something weird, while watching for the shooting stars I saw what I thought was a plane at first but it didn’t have the signature blinking lights that you normally see. It was traveling north to south o er half the length of the sky and was moving the speed of a plane it made a sharp turn and then disappeared. Kinda strange wouldn’t you agree? Saw huge fireball come down on 9/24/15, around 9-10pm while traveling south on TX 77 going to Corpus Christi. It was so fast as big, lit up the sky. Had to be a meteor. I was wondering if it hit anything, or harmed anyone? Meteors rarely survive all the way to the ground. It would be national news if it did or actually struck someone. Seen in Houston , Texas at around this time. Looked like a big, huge fireball with red, orange, and yellow sparks!!!! Marblefalls texas, driving home about 21:00, I saw one but it broke apart And kinda spectrumed. Last night my family and myself saw a ball of fire traveling very low . We saw the ball of fire go up higher to the night sky. My daughters and myself then saw the orange ball of fire turn off and we then saw what looked like a very faded star speed off!!!! !